the roof to advise you on any work that is required. Despite the fact that all thatch roofs have a lifespan, there is always ways to prolong the natural life of a thatch roof. If problems with the thatched roof have not been managed properly overtime, caring for the roof can be very high maintenance. By assessing the condition of the roof and with consistent maintenance, serious problems can be prevented. The term ‘brushing’ is the process of removing the top layer of thatch from the entire roof. When exposed to the elements, the outer layer of the roof will slowly rot. During brushing, this layer of rotten thatch is removed. This process should be done several times during the life of the thatch. The outer layer of the thatch holds moisture which if left for a long period of time can penetrate deeper into the roof. As a result the thatch will end up as compost. When the outer layer has been brushed, the deeper layer of the thatch will dry out. This layer will then be removed after a period of time and the cycle will continue throughout the roofs life. A roof should usually have 3-4 brushings throughout its life. The average thatched roof should need brushing every 8 years but it does depend on the type and quality of thatch, the pitch of the roof and the local climate. Occasionally roofs can go 15 years or more without being brushed, however some will need brushing after 4 years. 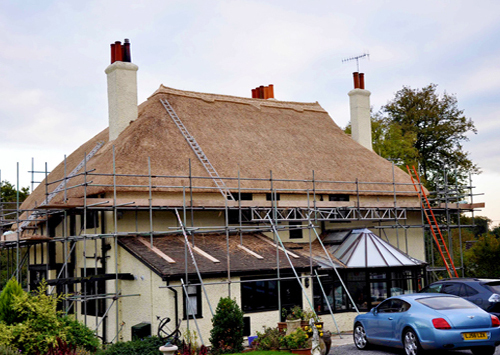 A thatching specialist will be able to assess the state of your thatch and the roof and advise you on what needs to be done before any work is completed. How are Thatched Roofs brushed? The method usually depends on the type of thatch and also the Thatcher; however there are many different types of thatching. A thatch roof can be brushed by hand or with pruning shears. This method consists of pulling out parts of the thatch, cutting or breaking off rotten ends and then brushing the thatch into place on the roof. This method is slow and is usually only used by small scale Thatcher’s. Using a hedge cutting machine is a more effective efficient way which involves cutting the outer layer of thatch without sections needing to be pulled out of the roof. This process means that there are fewer disturbances to the roof, however the thatch is still brushed into place and compacted. In order to prolong the thatched roofs lifespan, the compaction of the thatch is a very important factor. Moisture is encouraged into the roof if the thatch is loose and not tightly packed. This will mean moisture will penetrate more deeply in the roof and will also increase the likelihood of weather damage and animal damage. After brushing, it is important that the roof is compacted well afterwards, regardless of what method is used. Compacting involves tightening the twines from inside the roof. If the roof has been brushed and has poor compaction, it is possible to add bundles of thatch to achieve a higher density of thatch on the roof. It is wise to try and find an experienced and specialist local thatcher who will know about your area and will understand what materials and techniques that are used around your area as there are different traditions around the country. In the UK, the National Council of Master Thatcher’s and the National Society of Master Thatcher’s are the main bodies acting for Thatcher’s. When looking for thatcher’s, these associations can help you find your local Thatcher. It is advisable to get quotes and compare prices, by giving detailed requirements for the work. It would also be good to talk to previous clients as experience is very important.